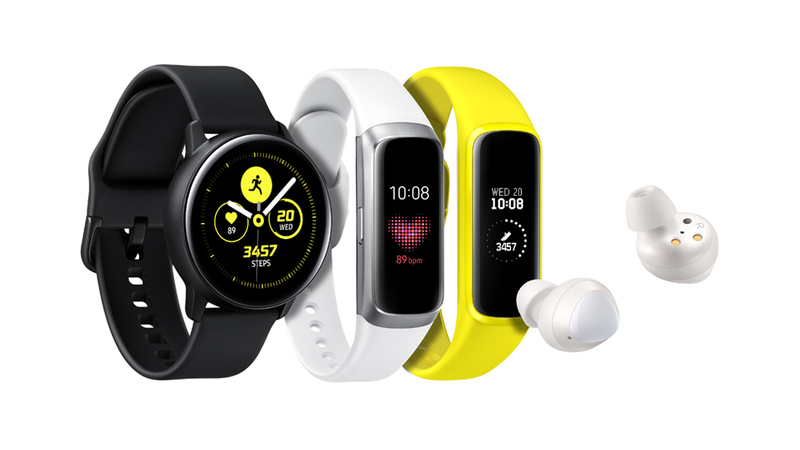 The Galaxy wearable line expands to include Galaxy Watch Active, Galaxy Fit and Galaxy Buds—sleek, modern devices that make it easier to manage fitness and wellbeing. Easy Fitness Tracking: Choose your activity and get started. It’s as easy as that. Galaxy Watch Active keeps up with you by auto-detecting when you run, bike, row, use the elliptical trainer2, or start a dynamic workout. You can manually engage in more than 39 activities, set daily goals and monitor your progress. The slim and fashionable Galaxy Fit and Galaxy Fit e enable easy and intuitive tracking to help you reach your fitness goals. Galaxy Fit and Galaxy Fit e automatically start tracking your activity when you walk, run, bike, row, hop on the elliptical trainer or start a general dynamic workout. You can also manually select from more than 90 different activities in the Samsung Health app on your smartphone, and Galaxy Fit/Galaxy Fit e will automatically start to track your chosen workout. Plus, with enhanced sleep analysis and smart stress management, you can monitor your wellbeing at any time of the day. Galaxy Buds keep up with you all day, with up to six hours of Bluetooth streaming, and up to five hours of calls. Plus, their compact case holds a charge for up to seven hours4, and gives the Galaxy Buds 1.7 hours on a 15-minute quick charge. With wireless charging and device-to-device power sharing, you can also get a quick charging boost on the go from Galaxy S10 which is the latest Samsung smartphone. For more information about Galaxy Watch Active, Galaxy Fit/Galaxy Fit e and Galaxy Buds visit: news.samsung.com/galaxy, or www.samsungmobilepress.com/galaxy-wearables. 2 Automatic tracking feature for rowing machine and elliptical trainer is only available on GALAXY FIT only.